I make unique handmade books and teach book making and other paper related workshops. I make a wide variety of books. 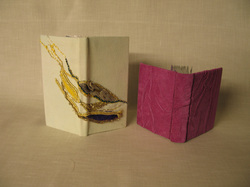 All are very tactile and just ask to be handled and filled with your stories, sketches, recipes, songs. To see more images of my books go to 'My books', or click on the image on the left. 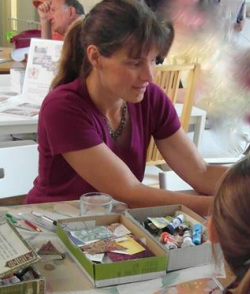 I have been teaching book workshops since 2005 and have taught a wide variety of book workshops at many different venues around Devon and Cornwall. 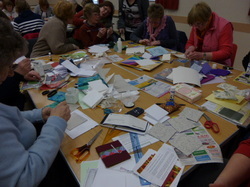 For more images and information about the workshops I offer go to 'Workshops and Talks', or click on the image on the left. In 2015 I moved from the northern edge of Dartmoor down to Falmouth in Cornwall. I now have my own studio and although I will still be going out to teach at other venues I will now be offering a variety of book and book-related workshops from home. My main income since 1986 has been as a self employed gardener, working for private individuals. I still do gardening, and intend to continue, but have also been moving into teaching more and more over the last few years. I also have a wide variety of other craft and art interests and in my spare time I work on my own garden, sew, sketch, spin, play the guitar and sing.